Posted on Mon, Feb 20, 2012 : 12:30 p.m. The Ann Arbor Board of Education voted 5-0 over the weekend to approve district-wide all-day kindergarten for the 2012-13 school year. 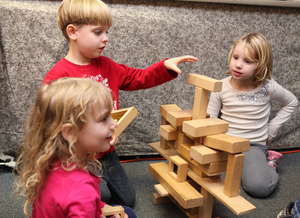 (From left to right) Jessica Beaver, Ben Cretsinger and Rachel Busch practice some architectural skills while building blocks at Lakewood Elementary School in December. Ann Arbor just voted in favor of switching to all-day kindergarten district-wide for 2012-13. The vote took place at a special meeting Saturday with a quorum present. Trustees Irene Patalan and Simone Lightfoot were unable to attend. The meeting was called on Friday with the sole purpose of voting on all-day kindergarten. Wednesday’s Committee of the Whole meeting revealed the trustees were unanimously in support of switching to the full-day program, so the trustees thought it would be best to formally pass the superintendent’s recommendation and inform families in the community. The board does not usually take action at its Committee of the Whole meetings and the district is off this week for mid-winter break, so the next regular board meeting is not until March 7. That is why a special meeting was called. The full-day kindergarten program will replace the gamut of kindergarten choices currently offered by the district. Mon, Feb 27, 2012 : 12:09 p.m. There is little evidence to support the notion that all-day kindergarten is beneficial for children. No long-term boost in learning, scores, etc., is observable. Developmentally, we have two groups of students entering kindergarten: those who have been primarily in daycare for the preceding four years, and those who've been primarily at home with a parent (or other family member) for the preceding four years. It is difficult to know how to structure a kindergarten program to best serve both groups. Perhaps we need a &quot;tracked&quot; kindergarten program? Thanks to 'Sarah', who also commented on this page, for pointing out that kindergarten is not required by law. Perhaps more parents should take advantage of that legal option. In any case, it would be good to offer half-day kindergarten at least as an option. The district might lose some money for offering half-day, but the long-run educational and developmental gains would be worth it. I rarely comment on stories, but this is one that I feel pretty strongly about. I am not against full day Kindergarten and understand that for many kids and parents it is beneficial and desirable, but I am extremely disappointed that at least one 1/2 day option is not going to be made available somewhere in the district. I would drive my daughter to another school for that option, but I will not be sending her to full day kindergarten. I work from home in the evenings and I do not have child care during the day. I value the time that I spend with my kids and recognize that not everyone has this luxury, but I also have 2 older children and know what it is like to be without them all day. I also like the idea that we have had a gradual transition for our first two kids from 2 half days of preschool to 3 half days of preschool to 5 half days of kindergarten to full days in 1st grade. I know kindergarten is not compulsory, but if I send my 3rd child to 2 years of preschool and then do nothing or homeschool her in kindergarten then she will lose that stepped up transition. As I said, I applaud that a full day option will be available for families who need or want it, but I am so upset that other options will not be available for those of us who have different needs. I heard that there was some concern that AAPS was losing students to alternative schools because of not offering full day kindergarten, but I can say that my not offering some 1/2 day program, you will also be losing some. I have spoken to enough people about this issue since it has been discussed for several years to know that I am not alone in my thinking. I'd welcome comments with suggestions for affordable 1/2 day kindergarten programs in the area. I still have a couple years to think about it as my daughter won't be in kindergarten until 2015-2016, so hopefully I'll come up with something by then, otherwise I may have to start a cooperative kindergarten of my own! For a co operative K? You need a licensed teacher. I know, mine went to a co operative preschool and it needed a licensed teacher. Tue, Feb 21, 2012 : 1:45 p.m. I had no idea that was the name that I picked for my user name. I must have signed up for to comment a long time ago. i really don't believe it and I'm not sure what I was thinking at the time. I actually feel strongly that people who comment should use their real names, so for the record, mine is Janine Hutchinson. Tue, Feb 21, 2012 : 1:26 p.m.
My daughter was fortunate enough to experience an &quot;experimental&quot; all-day kindergarten in the Ann Arbor Public Schools in 2003-04. Child-rearing has changed in many ways over the last few generations, and the half-day kindergarten is obsolete. Ann Arbor has been behind the times in this respect. Back when I started school (during the Eisenhower Administration), half-day kindergarten was intended to ease the transition for 5-year-olds who had spent their entire lives at home. I remember lots of crying and wailing on the first day. More than four decades later, when my daughter started school, it was nothing like that. She and her classmates had already experienced day care and/or preschool, and kindergarten represented continuity rather than an abrupt change. No tears were shed in her classroom. Tue, Feb 21, 2012 : 7:54 a.m.
Ann Arbor didn't approve anything. 5 people made a decision most likely based on little more than money. Tue, Feb 21, 2012 : 3:54 p.m.
Tue, Feb 21, 2012 : 3:33 a.m.
Kindergarten remains non-compulsory in the state of Michigan. If people think a full day kindergarten program isn't the right choice for their children, they are fully within their rights to not send them at all until first grade. Meanwhile, many of the rest of us would actually like to join the 21st century and do NOT feel that this development represents &quot;slipping into happy, institutionalized slavery.&quot; It's well past time AAPS did this, state budget influence or not. I'm just sorry it wasn't in time for my daughter to benefit, fortunately my son will. Tue, Feb 21, 2012 : 7:55 p.m.
jns131, my understanding is that Granholm introduced that bill, but it died in the legislature. Tue, Feb 21, 2012 : 3:23 p.m.
Actually that is false. Granholm changed that about 3 years ago to make it mandatory for children to start K before 1st grade. I remember learning about it 5 years ago. I too was very surprised to learn this. So, no, this is false. Granholm changed this. Mon, Feb 20, 2012 : 8:38 p.m.
Really? A special meeting was necessary...they knew all along that this was their plan. The timing and method of approval just make the school board and AAPS seem suspicious in their actions. They waited until school had recessed for mid winter break - with most families out of town. The A2.com coverage does not even make the headlines or the top 3 at 3 update! What options are going to be provided for those who do not want all day kindergarten for their children? When kindergarten was a half day, options were available to those wanted full day services. I find it amazing that 5 people voted in a special meeting and know what is best for every incoming kindergarten student in the future. Mon, Feb 20, 2012 : 10:16 p.m.
As others have pointed out, this is not about what is best for the children, it is a reaction to a state policy change that pays half as much money for half as much class time. Whether you agree that this is the right thing to do or not, we can thank Lansing for this change, not our superintendent and local school board. Given a choice, they would have spent the extra money on any of the following: retention of failed administrators, athletic facilities for the football program, alternative schools for the wealthy, legal defense for bad decisions, or a payout for the superintendent to not take our health insurance plan she doesn't need. Can we have it apply this year so that i don't have to pay for it? It was big bucks! Mon, Feb 20, 2012 : 8:01 p.m. The story fails to mention that next year the state will start counting a half day child as half a student for funding purposes. Currently, a child attending for half a day receives the full state funding allowance but this will change next year. I think this is relevant to the decision and deserves mention in the story. Tue, Feb 21, 2012 : 4:07 p.m.
Mon, Feb 20, 2012 : 9:52 p.m.
Mon, Feb 20, 2012 : 8:31 p.m.
Alan, that information was not included in this story because we have published multiple stories about the state funding aspect recently, including a piece Thursday after Wednesday's Committee of the Whole meeting explaining the costs and savings to the district. For a more thorough look at how AAPS weighed its decision, check out Thursday's story: <a href="http://bit.ly/A1p1A2" rel='nofollow'>http://bit.ly/A1p1A2</a>. Thanks for your comment! Mon, Feb 20, 2012 : 7:35 p.m. I am strongly against all-day kindergarten. All of these extended hours and all-day care centers are for parents to make more money, not for quality of life for children. Parents would rather have more spending money than time with children, that is what this says to me. When someone says that &quot;all-day care centers are for parents to make more money, not for quality of life for children. Parents would rather have more spending money than time with children, that is what this says to me&quot; it it tends to annoy people who work hard at work AND who work at home to be good parents. Your reply to me ended with &quot;there are still a lot of people who believe that children should be raised by their parents.&quot; To say that my child is not being raised by me because she went to daycare and kindergarten full-time is wrong and insulting. I have the responsibility as a parent to give my daughter good, quality time when she is with me and also ensure that the people who were involved in her daycare were also providing her with high quality care. I know what the studies say, but I also know that my daughter could read when she STARTED kindergarten and that in first grade she is reading and doing math at the third grade level. Her academic achievements surpass those of most of the kids in her grade (most of whom come from two-parent families). I will get defensive when someone paints working parents with broad strokes and I will get irritated when someone suggests that anyone other than me is raising my child. Tue, Feb 21, 2012 : 5:03 p.m.
You people sure get abusive. Get real? You should learn to reason and communicate critically. I didn't suggest that all day kindergarten was a new idea in the last 40 years. I was in all day kindergarten in 1962. I said that the proliferation of single parents and families without an at home family care giver has increased over the last 40 years, as has the acceptance of such. 50 years ago, the number of families without an at-home parent was negligible compared to what it is today. The effect on children is measurable. There are a lot of reasonable explanations for why this is so, including economics and changes in attitudes. I don't see that I even offered an opinion. I said that not everyone finds this trend acceptable. Tue, Feb 21, 2012 : 3:21 p.m. The last 40 years? I believe I was in an all day K 40 years ago. Get real. I agree with northside and a few others on this all day K. Sounds to me like some don't want to let their children go right now. Mine graduates from hi school in 3 years and is very well rounded. Keeps me broke, but well rounded. I don't see any problems with this one. Mon, Feb 20, 2012 : 10 p.m.
You seem to be quick to take offense Northside. I don't see anyone demonizing working parents. I believe that not everyone agrees that the trend toward single working parents and children raised in daycare is necessarily good or acceptable. We don't know your circumstances and it's good that you do your best but every study that I've ever seen concludes that children raised in single parent households and raised significantly by non-family members have lower levels of educational achievement and attainment and suffer higher risk of behavioral problems, teen pregnancy, substance abuse, and criminal behavior. One could certainly question the factors that contribute but the statistics are clear. This has been a trend of the last 40 years and some find it unacceptable. There are still a lot of people who believe that children should be raised by their parents. Mon, Feb 20, 2012 : 8:28 p.m.
Who are you people who demonize working parents?! What fairytale land do you live in? I am a single mom and all-day kindergarten certainly eased the burden of childcare costs. I don't work to get rich. I work to provide a life for me and my child. We don't have a luxurious life but we have a happy one. Please do not make generalizations about working parents. Mon, Feb 20, 2012 : 8:27 p.m.
@AAW I believe Linda refers to couples who sacrifice family life just so they can keep up with the expenses of their materialistic lifestyle. In the case of single parents, govt/boards efforts should be made to equilibrate (between both parents) the financial burden of raising a child. This would allow you spend due time with yours. However pushing the kids into forms of all-day-orphanage will do more harm than good in the long term. This is true regardless of administrative technicalities. Mon, Feb 20, 2012 : 8:03 p.m. I am sorry I disagree. For a single parent this will save them money and allow their child to be in a school setting instead of at day dare. It is not about making more money. Mon, Feb 20, 2012 : 7:22 p.m. It is sad how efforts are spent towards an &quot;all-day family disintegration&quot;, rather than promoting parent-child quality time. 21st century slipping into happy, institutionalized slavery. Just curious HardWorker. How many children do you have? Tue, Feb 21, 2012 : 4:17 p.m.
Again, this is NOT against single parents or about conspiration theories. A parent is (or should be) more effective taking care of his/her own children than a State employee watching dozens of kids. Children need to spend more time with their parent(s) as opposed to being all day with an appointed stranger. This is why parents should push for parenthood-friendlier conditions, instead of rejoicing about cheaper daycare alternatives. Accelerating separation of families will accelerate addictions, non-planned pregnancies and other big issues that our society is experiencing. Sounds to me like Ann Arbor parents do not want their children to be torn from the apron strings. Mine was happy to get out and play with other children. Be in a school setting. I worked, but not full time. I was happy to have that break and happy to know she was happy having fun. Good grief parents, let your children go. Tue, Feb 21, 2012 : 1:29 p.m.
HardWorker - More than half of the children born in the US now are born to a single parent according to the NY Times article. Mon, Feb 20, 2012 : 11:23 p.m.
@HardWorker, Sounds like a conspiracy theory. Who do you think runs our schools? Who do you think puts these requests forward for consideration? Who do you think pressures the school board to vote and approve these things? Big corporation? Big Government? I have yet to meet these special races of people we blame these things on. It's us, people. Us. All of us. Let us all recognize this, along with the mechanisms _we_ put in place to influence and change it. We are empowered, unless we choose to give that power away. @NorthsideHobbit, It's not a matter of daycare vs all-day kindergarten. This is about a spiral of longer daycare/kindergarten/other schedules so that parents can be squeezed at work for longer hours. At this pace, the next generations will be pleased to hear when all-day-all-night kindergarten gets approved, allowing parents take their two-hour overnight break. &quot;All-day family disintegration&quot;? Are you kidding me? As a single-mom with a full-time job, I was thrilled to find out that all-day kindergarten was an option. I moved the summer before so that my daughter could be in-district at one of these schools. She was already in daycare full-time so moving to all-day kindergarten wasn't a huge change to her schedule. As far as family disintegration, I'm not sure how this contributes to it. I work full-time to provide a decent life for my daughter and me. It's my responsibility as a parent to make sure that the time we spend together after work and school is full of love, support, and family time. Whether she went to kindergarten for 4 hours or 8 hours would not have changed this. Very happy about this change. My daughter will start kindergarten soon and she's ready for full day! As a working mom I would have to find afternoon child care anyway... glad she will be involved and learning! Mon, Feb 20, 2012 : 6:08 p.m.
Just observing my two children, half day kindergarden was enough for them. Both my kids took naps when they got home. Tue, Feb 21, 2012 : 3:15 p.m.
Perry School in Ypsilanti has all day K. Yes, they do give the children a half hour to nap and then to spend the rest of the afternoon to play. I have seen it and love their program. They spend the morning doing K stuff, lunch, rest and then more learning and play. I believe this is how the formula will go. Mine out grew naps when she was 3. We went charter for all day K. They did not do naps to my recollection. Mon, Feb 20, 2012 : 8:22 p.m. This is what worries me &amp; I hope they take that into consideration when they plan out the day for these young children. For many, this will be their first experience in a group setting and it is going to make for a very long day. Pros and cons for sure. Mon, Feb 20, 2012 : 5:52 p.m. Finally! Ann Arbor moves into the 21st Century. Look out world! Tue, Feb 21, 2012 : 3:13 p.m. Took 10 years but they are finally approving it. Wow. Give AAPS a V 8. First, a question for Danielle Arndt &amp; A2.Com: Why isn't Education listed as one of the main tabs when one opens the homepage for A2.Com? Nobody should have to search (even one step) for this! Re. ADK, it's about time!